Babe has been around the bay for years but we really only became aware of her when a local wildlife photographer reported seeing her walking along Back Bay Drive near the Salt Dike back in December of 2005. It was funny because he said he thought he was seeing a domestic cat walking past his parked truck and even got on his knees and called "here kitty, kitty". 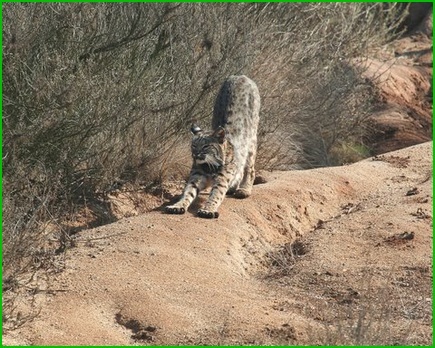 His photo of that kitty was our first confirmed bobcat sighting in many years in the Back Bay at Newport Beach. 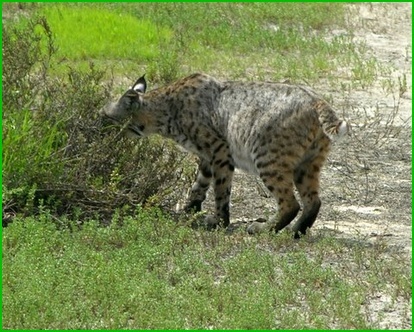 Then, only a few months later one of our naturalists called and inquired about a bobcat he had seen hiding in the bushes near the Marriott Hotel. 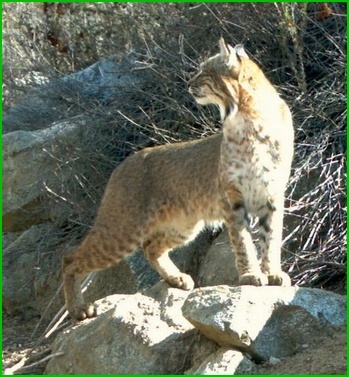 Concurrent with all of this, I was aware of a much larger research project being done in part by the USGS on bobcats in the San Joaquin Hills and so I contacted the lead person on that project and ultimately became one of their volunteers. I also offered them the opportunity to expand their research to include the Back Bay. 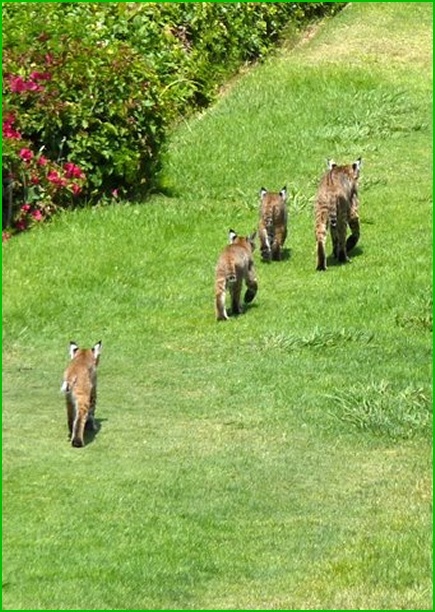 A few months later they started to look for bobcats in the "urban pockets" as they called the Back Bay and the San Joaquin Marsh. Over the months that followed, we found lots of tracks and other sign and cameras were ultimately placed along likely animal corridors. Next came the traps, but for some reason Babe would have nothing to do with them until on the evening of December 14th 2006, when a call was received from one of the local animal control officers reporting that residents of the Harbor View community were seeing bobcats walking along a footpath near their gated entryway. That same night a cage trap was placed in the bushes nearby and to entice the bobcats to enter that trap, the hind quarter of a road-kill deer was dragged along the trail leading up to it. Early the following morning of the 15th when the trap was checked, we leaned of our good fortune. In fact, we learned that we had really hit the jackpot because another trap at San Joaquin Marsh had also activated. We knew our local bobcat had three kittens and they were nearby, so she was quickly examined and provided with a small white tag in her left ear and a radio collar around her neck and released, but not before getting her new name. "Babe" seemed a fitting moniker for a bobcat living in the Back Bay. The next morning she was observed with her three kittens crossing the foot bridge down in Big Canyon and for the following six months before her collar automatically detached, we were able to track her movements using radio telemetry. Each year since she has given birth to another litter over on the east side of town. Knowing her travels in to the residential area of Dover Shores were continuing, I figured she was looking for a birth site in that vicinity. Normally her choice of a birth site would not cause any reaction on our part but this time it was different as I was aware of three other bobcats that had been killed recently by cars and one of those was a young female that had just given birth to three kittens; A three day search to rescue them was unsuccessful. When I realized that Babe would be crossing Santiago Drive at least twice a day to feed herself, and knowing she had previously shown little caution before crossing streets, I got really concerned. What if she did give birth and then got hit like the other cat had done? I decided I had to know exactly where the kittens would be hidden just in case they needed to be rescued and that started my search. I followed up on every call, most often in person to inquire exactly where they had observed the cat and where she had gone. Behind what bush? Point it out to me. Did you see her more than once? What time of the day I asked until I began to get a picture of what she was doing. She is smart, duplicitous and did not always take the same route moving through the neighborhood. I figured she was still shopping for a specific site while not wanting to leave a scent trail that a coyote could follow. I knew her ultimate goal would be to find a walled-in yard that would be coyote proof, one that was virtually unused, had some type of structure or wooden decking that she could squeeze beneath when it came time to give birth and it would certainly be a yard free of children or pets. I began to see her patterns emerge, first in the back yard of one corner house whose interior was being extensively remodeled, then down another block in the rear yard of a house, a rental that had been vacant for several months. Often I got a neighbor to go with me into those yards as I looked for the perfect yard. I was certain I would know it when I found it, based upon having seen others in previous years. We found her tracks in gardens going around and over fences. When I couldn’t figure out where she went, we would put down a little chalk dust to help us follow her tracks, and I was surprised when I found her hopping up on top of a block wall and then taking a short cut over the roof of the house next door. I though she would stay within a block or so of the bay but we kept getting reports of her being as much as a third of a mile further in so I put cameras in several more yards to see if we could figure out where she was going. On March 21st I received a photo of Babe hunting along the arroyo close to 23nd street. When I saw how pregnant she appeared in that photo I realized I only had a few days longer before she would disappear and give birth. When other callers reported seeing her drinking water out of street gutters I knew she was starting to lactate. I interviewed any one who would stand still for a few minutes as many of you know. I talked to contractors, realtors, postal people, folks walking their dogs, pushing carriages, or just talking with others along the street until I narrowed the search down to a few houses along Holiday Road. Then early one evening I received a series of panic phone calls from some of my contacts in that neighborhood alerting me to the fact that another neighbor had chased a bobcat down Holiday and up in to nearby tree. Apparently Babe had been observed in a man’s backyard making a snack out of one of his pet rabbits and the owner took umbrage chasing her down the street for several blocks. Fortunately, the responding forces showed due caution in their response and separated the parties long enough to allow Babe the opportunity to make a quick escape into the dark. Another resident living very near that tree gave me a call and reported having seen her walking through his yard frequently before disappearing into an ever expanding hole in a hedge that separated his yard from that of a neighbor just west of him, a neighbor who was never home, or perhaps had even moved out. I knew I had finally found Babe’s new home and then it was just a matter of finding a way to get into the yard of the mysterious neighbor to verify it. I checked on-line property records and talked to other neighbors only to learn that the occupant hadn’t been seen around the house in many months. Finally one night the mystery resident called the police and complained of a bobcat being in his backyard. I managed to get his number and left him a call, then I left more messages asking for him to get back to me as I knew I could help or at least explain what was going on with the bobcats. Finally, days later I got a call back from him and I was ultimately allowed to enter his yard to install a remote camera. We focused the camera on a depression in the ground that provided access under a wooden deck that looked exactly like natal dens that I’ve seen before. During the next few days, we got something like 1300 pictures on that camera showing Babe and her baby kittens playing in the yard nearby. Meantime the next door neighbor was getting some great shots of her as she walked past his pool to get in to "her" yard. We put more cameras around his pool and in the back yard of another neighbor as well. We had sensed a strange urgency on the part of the mystery resident during our first visit and we decided to pull our camera out of his yard several days later. We did this only hours before the property was foreclosed on and he abandoned the premises. The next morning Babe was not having anything to do with all this stress and promptly moved her kittens down towards the bay when she was photographed crossing Galaxy by a passing realtor. That photo was sent to the Daily Pilot and ultimately created a firestorm of attention in the neighborhood. The kittens were way too young for this sudden relocation but they adapted. From Holiday Road she moved the family down along the hillside behind Galaxy to a location near Bluff Park where they stayed with another nice family while enjoying those beautiful views overlooking the bay. For years now, we have had a camera in another back yard on Galaxy and it is on a corridor used year-round by Babe so as she moved up and down along the edge of the bay we would get new photos and be able to figure out what she was doing. If she was carrying a rabbit, then she would have been heading in the direction of her kittens, and if no food was seen then she was going out to hunt. Side view photos of her revealed if she was still lactating and so we knew when the kittens were weaned. We were also able to watch her teaching her kittens how to climb trees or more correctly, how to climb down out of the trees. This is a critical skill as it is their best-last defense from people or dogs. She also taught them to avoid certain other animals such as raccoons and opossums. Bobcats don’t feed on domestic pets other than an occasional rabbit or chicken, and they don’t care for your handouts either. In fact, when well meaning folks leave food out for her they are only feeding the raccoons, opossums and perhaps attracting the very coyotes that she is trying so hard to avoid. Think about that, - She comes in closer to us to get away from the very coyotes that we are attracting by providing food for them. 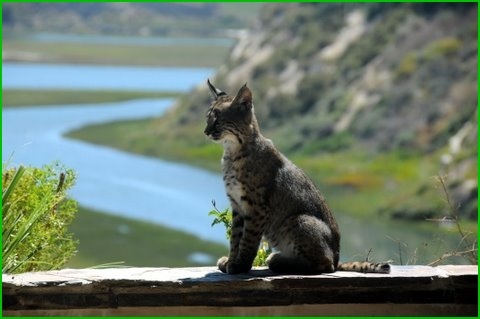 Once the kittens were weaned and able to follow along, Babe ultimately took them on tour going as far west as Castaways Park overlooking the Pacific Coast Highway before heading back north along the shoreline going up to University and then around to the East Bluff for a short visit. She and her kittens are doing well but there are changes on the horizon, changes we may not fully understand right now. Earlier I mentioned that the offspring each year would have to disperse and establish their own territory but in a restricted "pocket" like the Back Bay there is ample evidence this is not happening. Additional research is clearly needed if we want to learn the long term results of this. If you are interested in participating or could help to support it let us know.